Teacher’s Comments: A good resort course in a spectacular setting. 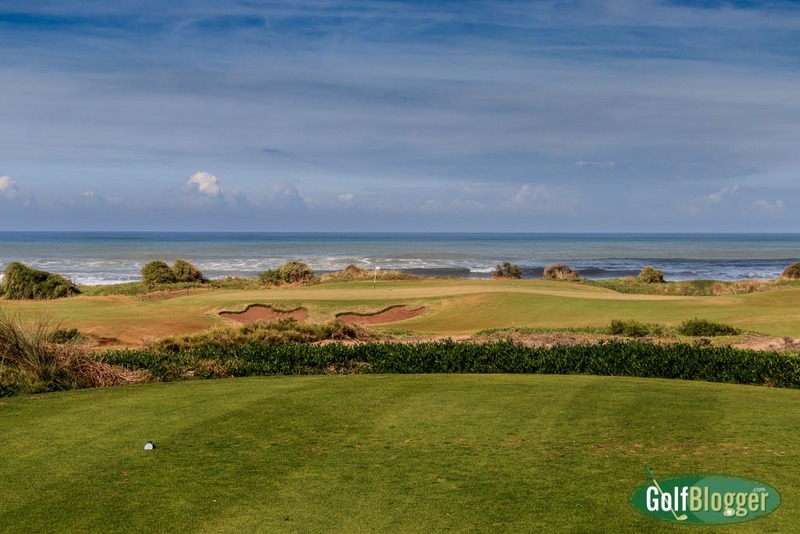 Gary Player’s Mazagan golf course at the Mazagan Beach Resort in Morocco, has everything you could want in a resort course: interesting holes with lots of options; wide, difficult-to-miss fairways, receptive greens and lots of great views. 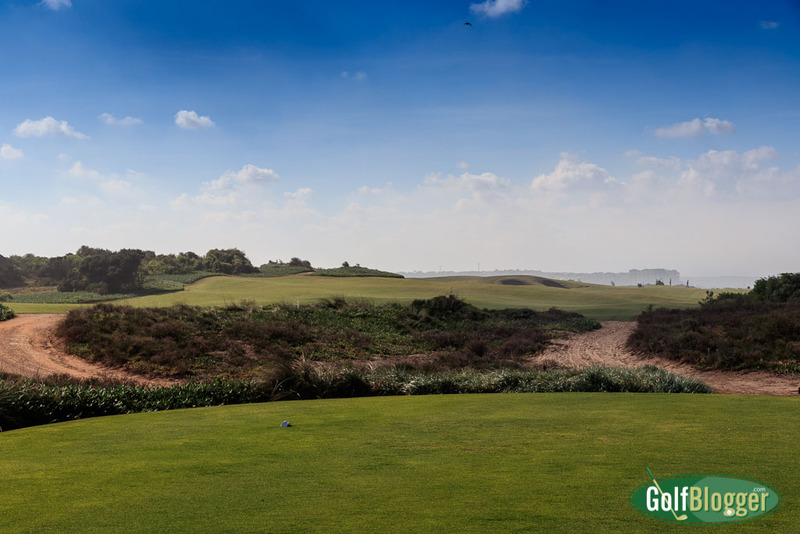 On the other hand, as the longest course in Morocco at 7, 484 yards, Mazagan also can demand heroic tee shots, present difficult angles to the green, and just generally mess with your golf self-esteem. It all depends upon where you tee it up, which is the mark of a good course. I played Mazagan forward and found it challenging, but fun. A longer hitter, from the back tees might find an entirely different course. 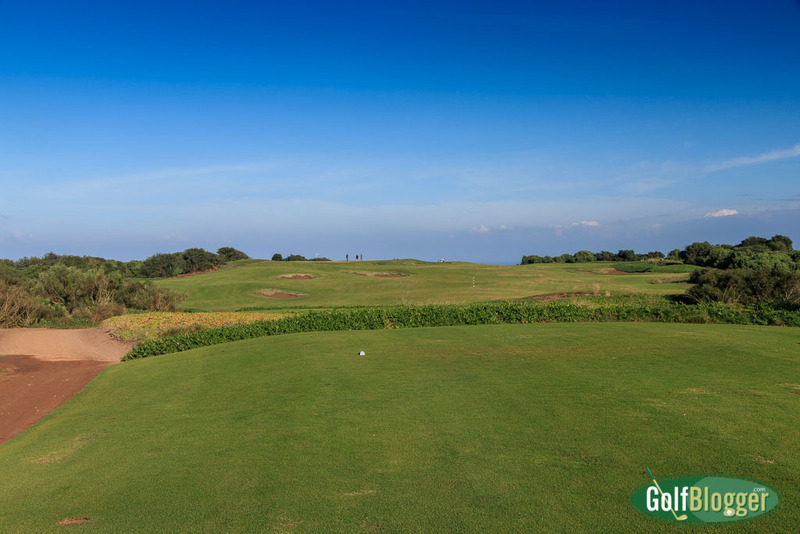 The third at Mazagan is a 477 meter par 5 that plays downhill from the tee. Player routed his Mazagan golf course around the contours of the dunes along Morocco’s Atlantic coast. Most of the holes have a view of the sea, and the ones closest are just a dune away from the beach. For a course by the sea, Mazagan had a surprising number of holes with significant elevation changes. Trees were present only on a few of the holes furthest from the water. In the rough off the fairway, a viscous ground cover called ice plant will grip a wayward ball and not give up without a fight. Those plants are, in many ways, more penalizing than the cork forests that line the fairways of Royal Golf Dar Essalam. If you are in the rough at Mazagan, though, it is a truly unfortunate confluence of bad shot and bad luck. The fairways are more than generous; they are truly expansive. Some of them appeared nearly as wide as the hole was long (although they of course are not). My own encounters with the rough were the result of biting off more than I could chew, distance wise, on my lines of attack (and that, I will partly blame on the grass, which I will discuss later). Not all lies in the fairway are created equal, however. Player’s design clearly favors certain shot placements. With the ball in the correct position, par or better is likely. Get out of position — even in the fairway — and you are penalized. Mazagan’s fourteenth is a 562 meter par five with a blind tee shot over an enormous bunker to an elevated fairway. Spotting the correct position and imagining a line was sometimes difficult due to rolling fairways, elevation changes, and tufts of wild dunes. I found myself out of position on a regular basis. On a second playing, I would score much better. The sixth at Mazagan is a 398 meter par 4. Mazagan has no water hazards, but I counted more than fifty bunkers. The most challenging of these were located in the fairways in positions where a less-than-precise tee shot could get into trouble, or which serve to shape the hole. A good example is Mazagan’s sixth. It also was my favorite hole at Mazagan. While it is practically impossible to miss the fairway, the placement of bunkers effectively turns the hole into a dogleg left. A good tee shot here plays right to the 150 marker, then left back to the green. Elevations changes on this hole added to the interest. The sixteenth at Mazagan is a 437 meter par four. The seaside holes were particularly beautiful. While there was never any danger of a ball actually finding water, the sight, sound and smell of the sea were ever-present. Proximity to the sea, however, does not necessarily make Mazagan a “links” course. I have not played in Scotland, but several of my compatriots had, and to a man they opined that Mazagan does not play like a links. I will trust their judgment on this point. On the day I played, there was enough wind from the sea to influence play. The ground was fairly soft, however, so the ball did not run. Conditions on the day I visited were mixed. The greens were in terrific shape, and the fairways completely grown in. Where course conditions fell short was that in mowing for the day, the crew seems to have used blades that had not been sharpened for a while. Or perhaps the blades were not correctly adjusted for height. In many places, the grass seemed torn, rather than cut. In others, chunks of grass had been pulled up. On occasion, the rough surfaces created problems for myself and my playing partners. It was the issues with the fairways that have caused me to waver between giving Mazagan a grade of “A” or “B+.” It is a special course, to be sure. The vistas are spectacular. But I also think that the standards for conditions at a premium resort course should be high and in that, they just missed. The pro warned that the course was not in good shape on the day I visited, and the presumption is that it was better in the past and would be better in the future. I am certain that a future visit would reveal premium resort fairways, but I also can only judge the day I was there. The grass the course uses, the Platinum variety of the Paspalum, is used for its resistance to salt water. It looks great, but took some adjustment from a playing perspective. The grass grabs the ball and club, offering unexpected resistance. In retrospect, I feel as though I lost a club-length in distance playing shots off the grass. I did not make the adjustment in a timely fashion, and so found myself short and in trouble throughout the round. Mazagan was a fun and interesting course that I would love to play again. The Mazagan Golf Course review was first published December 6, 2016 and is based on a round played November 20, 2016. Read reviews of other courses in Morocco, the Royal Palm Golf Course and Royal Golf Dar Es Salaam at the links. The first at Mazagan is a 387 meter par 4. The third at Mazagan is a 477 meter par 5. The fourth at Mazagan is a 269 meter par 4. 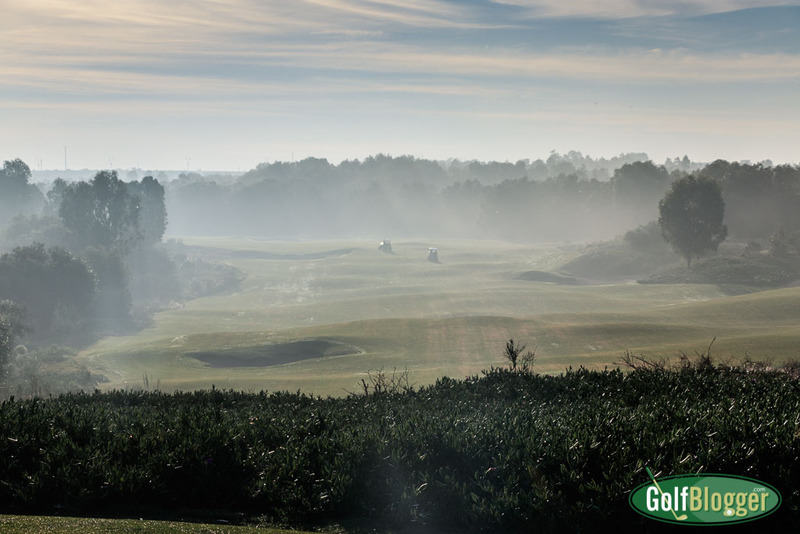 The seventh at Mazagan is a 527 meter par 5. A view of the seventh green. The eighth at Mazagan is a 427 meter par 4. The ninth at Mazagan is a 426 yard par 4. A view from the elevated fairway on Mazagan's fourteenth. The seventeenth at Mazagan is a 429 meter par 4. 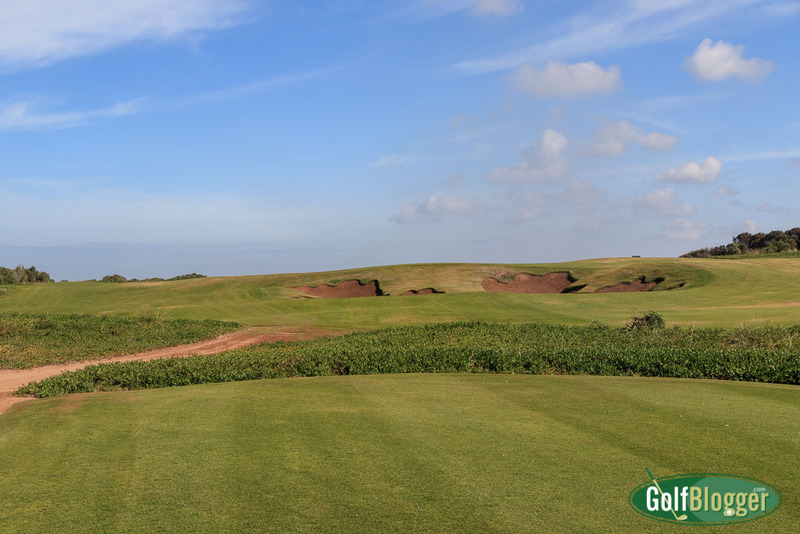 A view of the eighteenth green at Mazagan.